A New Climate of Cool? Al Gore may have won an Oscar for his vision of impending doom (unless we mend our carbon-emitting ways) in "An Inconvenient Truth," but February was anything but a good month for Gore's brand of global warming alarmism. There may, however, be signs that other politicians are about to moderate their tone and language on climate change. This ought not to come as a surprise in the light of the latest downsizing by the Intergovernmental Panel on Climate Change (IPCC) in regard to claims of forthcoming cataclysmic events. Along with other accruing scientific evidence, so much currently points to an overplayed alarmism and scientific data that is far from conclusive. 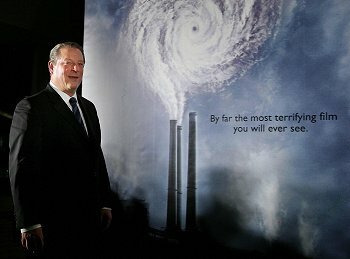 Firstly, in February the IPCC report downplayed its own apocalyptic scenarios upon which Mr. Gore's more colorful observations are currently based. The report, in fact, downsized its 2001 projections for temperature rises by a third and its projections for sea level rises by half. Almost before the ink was dry on the page we learned that America, allegedly environmentally "irresponsible," was actually doing a far better job of cutting CO2 emissions than almost any of the Kyoto-signing nations. Cue red-faced European Union embarrassment. As if that was not enough, the British-founded GLOBE (Global Legislators Organization for a Balanced Environment) group of nations meeting in Washington in mid-February decided to ditch the short-termist, potentially economy-destroying approach of Kyoto altogether. Instead, GLOBE's members signed a declaration establishing a long-term approach to stabilizing greenhouse gas concentrations. The organization's declaration is now likely to form the basis of a new accord at the coming G8 summit in June. You might think that a statement founded upon a belief in anthropogenic global warming would at last bring some harmony to the disparate alarmist and skeptic elements, but that did not occur. Responding to the new GLOBE declaration Charlie Kronick, head of Greenpeace's climate change campaign, was keen to maintain the hyper-rhetoric: "The projected target for climate-change gases would result in a disastrous three-degree increase in temperature. This would see the loss of 20-30 percent of species, melt two polar ice sheets, add one or two billion more people to those suffering water scarcity and trash the world's remaining rainforests and coral reefs. Real action and political will is urgently needed to prevent a global disaster." Note the "woulds" and "wills" in Mr. Kronicks' statement, which even the latest IPCC reports are reluctant to assert. In a letter to Nature in February, global warming scientist Mick Hulme of the University of East Anglia called this kind of media-hype "counter-productive" (Nature, 445, 818, Feb. 22, 2007). Hulme complained: "I examined the coverage of the IPPC report in the ten main national UK newspapers for Saturday, Feb. 3, the day after the report was released. The four quality newspapers all ran front-page headlines conveying a message of rising anxiety … and nine introduced one or more adjectives like 'catastrophic' and 'devastating'... yet none of these words exist in the report." He added, "The challenging policy choices that lie ahead will not be served by the type of loaded reporting of science seen in the UK media described above." As a well-informed layman and writer on the subject, I welcome Hulme's anti-hysteria call. Not least is the widespread assumption of a science consensus, as I have argued elsewhere, over the new and complex science of climatology, is itself irresponsible. Science writer Michael Crichton has said: "Let's be clear, the work of science has nothing to do with consensus. Consensus is the business of politics. Science, on the contrary, requires only one investigator who happens to be right, which means that he or she has results that are verifiable in the real world. … The greatest scientists in history are great precisely because they broke the consensus." The real world science (actual evidence, versus fraught computer modeling predictions) has in recent months, as lately revised IPCC predictions reflect, confirmed that skepticism has, to a degree, proven valid. But now increasing numbers of scientists have come forward to dispute even the "settled" view of the consensus science. Worse still for the alarmists, a raft of new evidence is specifically pointed to an alternative culprit altogether — solar activity. Two major books are also currently making the case for the effect of cosmic rays and solar activity affecting clouds, a key factor influencing climate. Water vapor (clouds) and not carbon dioxide is, after all, by far the major factor contributing to the greenhouse gas theory. "Unstoppable Global Warming: Every 1500 Years," by American climatologists S. Fred Singer and Dennis Avery makes out the historic case from ice cores, seabeds and tree rings for increasing (presently) cyclical solar activity. Professor Henrik Svensmark, with science writer Nigel Calder, in their new book, "The Chilling Stars: A new theory of climate change," reveals the more detailed evidence confirming this from the science laboratory. But the fact remains that we already know from historical sources that the earth has been hotter that it is today, and with no help from human-induced activity. In addition, Professor Patrick J. Michaels, a senior fellow in environmental studies at the Cato Institute, and author of "Meltdown: The Predictable Distortion of Global Warming" and "A Shattered Consensus" has recently lambasted Gore's film as a "riveting work of science fiction." Michaels noted that revised predictions by the IPCC on prospective sea level rises now reveal that, "Gore's film exaggerates the rise by about 2,000 percent." In the same article Michaels alluded to a February 2007 issue of Science magazine in which a new paper reveals that Greenland's ice loss from its huge glaciers has "suddenly reversed." See what I mean about February being a bad month for alarmism? Remaining unconvinced by the case for human activity above solar activity and aware of warming and cooling periods throughout history, I recently launched a new Web site, Global Warming Hysteria (http://www.globalwarminghysteria.com/ ), at the request of others to link all the relevant materials that the mainstream media appears reluctant to publish and cover. Though the GLOBE declaration may not go far enough in reviewing the actual scientific evidence for global warming unbelievers like me, I still welcome the far more rational tone it represents. Unfortunately, the media hype will not, I suspect, dim (scare stories are good for business) nor will Green angst be assuaged, even if the coming G8 conference does adopt the GLOBE approach. The ideological activists at Greenpeace will, no doubt, perceive any such moderation of alarmist language as merely "the typical capitulation of elites to capitalist interests." The Romans in the north of England, however, basking in the balmy late Autumn sun and sipping their locally made wine from locally grown grapes (try that today!) over 1,500 years ago, were more than happy to simply adapt and welcome, as man always has. The Vikings, on the other hand, who had set up home in Greenland only to find life becoming impossible when a severe cooling period arrived, were forced to adapt by leaving. It seems that our media-hyped generation may be the first in history to fear warming as much as cooling periods. Hopefully, the next G8 might help to foster an altogether cooler political perspective.